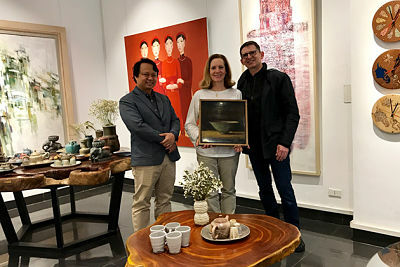 Artist Heather McClellan requests your presence at “Flex”, her Vietnamese-inspired lacquer exhibition. Heather McClellan received her formal training in graphics and illustration at the Cleveland Institute of Art, one of the leading art and design schools in the United States. A lover of materials and methods, Heather’s work continually leads her to explore new techniques and continual learning at the feet of masters of new crafts. 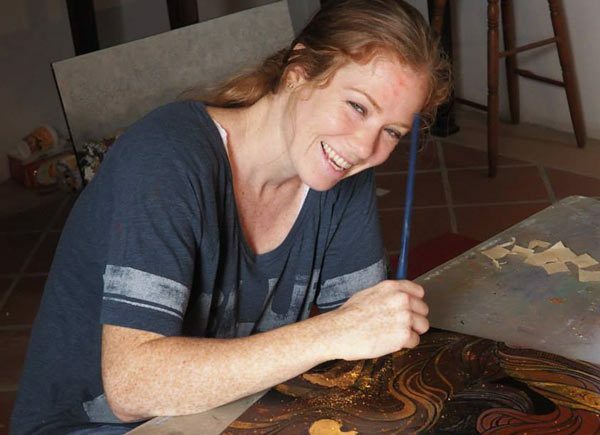 She works fluently in traditional media (ink, pencil, pastels, oils, and acrylics), but is also practiced in a diversity of methods (scratchboard, lithographs, ceramics, silk screens, lacquer, large murals, and mixed media). She regularly represents women as her subjects and draws her inspiration from a wide variety of cultures. Early in my career, my greatest struggle was in creating. I found that my passion for the human form and my God-given talents made it easy to illustrate, to show things “as they are”, but to me, this was disappointingly insufficient; art is so much more. It should evoke and stir others to passion. It should showcase imperfections and limitations. But most of all, it should be creative, meaning that it generates something new: an idea, a sentiment, a desire. I have found great satisfaction in experimenting across multiple techniques, perhaps because of the newness and my desire to explore, but more likely because of the imperfections they allow. Pencil and chalk are so precise that they leave little space for the beautiful accidents which manifest themselves in other media. As I force my technical skills into new and imperfect formats, I find it jarring, disrupting, exciting—and this excitement comes precisely because I don’t know what to expect. To me, this is creation. The exhibition is free entry.